What we're working on . . .
Patrick had a passion for riding and motocross. As we've mentioned, he had plans be a mechanic and try making a career in the industry. Throughout the years I've spent time making things for and with him: the coaster cart, putting together the JR50, making model rockets, rebuilding his vintage bikes and more. To continue making things and doing projects related to the sport he enjoyed is a way for me to remember him. On these pages we'll list a few projects and activities that we think resonate with Patrick and would make him smile. This was something I did for myself a couple months after we lost Patrick. Working with my hands and being alone were & are something that I enjoy and needed. This project allowed me to create a workspace where I can be surrounded by memories of him. It's nothing more than an 8' x 20' extension on the barn that I finished into a motorcycle work area. In keeping with the Hobo Motorsport way, it's small and simple. - everywhere I look I see him! Several people wore 714 jerseys in Patrick's memory - to the left if the one KLP wore and then he gave it to me. Still has the DD dirt on it. Below is a picture of he and I. To the right is a poster everyone signed and they gave it to me at the church service. These hang proudly in the Hobo Motorsports area. Patrick liked to name things. I could blame this on his girlfriend but it was really him - though I think she did help out. His XR70 was his second motorcycle and got the name "Rodrigo". He loved this bike. I would say part of the reason he was so fond of it is because he had it so long. He got it when he was about 9 years old. He rode it around the house and used it for trail riding. 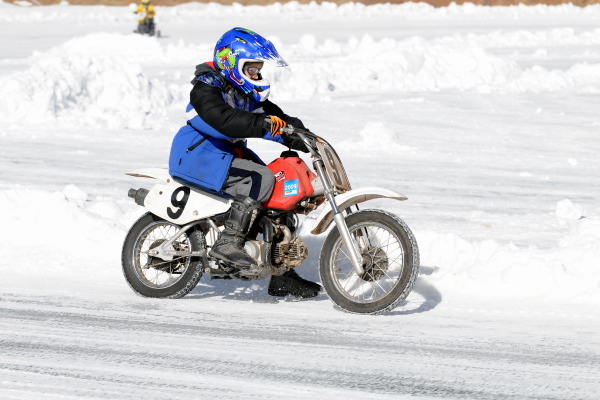 He rode at the ice races and won the PeeWee class in 2009. When friends came over inevitably Rodrigo would get drug out and they would take turns romping around on it. Most recenty Rodrigo saw more abuse as he rode it in pit bike races. Patrick got a kick out of those - again it seemed like the Hobo way: just silly fun. On the first race he saw his friend Ryan next to him and started yelling at him (all caught on the GoPro - I'll put in on the Hobo Facebook page). Then one time he rode it in the tandem race with his friend Trevor. Poor Rodrigo was already worn out but kept on going; so we decided to put a little effort into improvements. The combination of a tired motor and centrigial clutch made for paddling out of turns so I modifed the clutch to be a combo centrigal/manual set up which allowed him to slip the clutch. $130 for a new shock was a major expense but then the old shock really WAS shot. I fabricated an adapter to raise the ride height about 1.5" in back and some spacers for the front forks kept it balanced and make it fit his full-size body a little better. However like any racing, the competition heats up. Soon KLX110's & larger displacement Chinese pit bikes relegated Patrick and Rodrigo to the back of the pack. Since Rodrigo wasn't going to be making the trip to Arizona with Patrick I had been kicking around doing some upgrades while is was gone to surprise him - now it seems like the right thing to proceed. I think Patrick would approve! 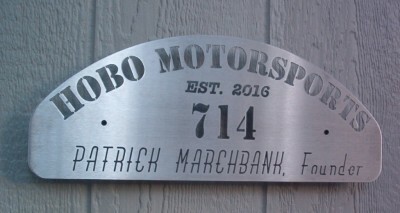 Dont forget to check out Hobo Motorsports on Facebook! I'll be posting several of Patricks antics on Rodrigo and other bikes. The plan is to have Rodrigo 2.0 ready by February 2018 for a Kicker Arenacross in Denver. Successful first outing! 31 pit bike entires, I finished 18th after starting from the second row. Patrick would have done much better than me but the bike runs strong. A lengthened swingarm is in the plans because with the extra horsepower, it's a little squirelly - a couple inches longer should make it more stable. The plan starts with adapting a set of XR80 forks. This will increase the travel by 1.5", raise the ride height (as it is still quite low) and require minimal fabrication. Additionally it will allow use of the original XR70 front wheel and brake. At this point the mods for the front forks are done. I had to notch the frame to allow the swingarm to come down farther to keep the bike balance for ride height. A few mods on the swingarm will give increased travel. Then I can put the chassis back together, put the motor in and start building the exhaust. 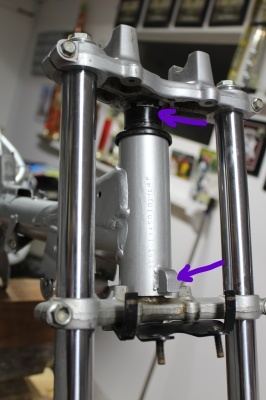 Notched frame - shown above, allows more swingarm travel. To the left is the finished lower shock mount. Changing the postion raises the rear ride height to match the front and the resulting change in leverage increases the travel by 20mm and softens the rear end. This shock was quite stiff anyway - Faster Mini's say it's set up for a 170lb rider which is too stiff and my intial "calibrated bounce test" says it feels like it should work. December 2017 - completed 2.0 version. Suspension mods done, handmade exhaust with 714 edition label, new tires. Link to the right is a brief test ride of the completed 2..0 version. Some more testing and adjustments will be necessary before competition but it's close! This was the site of many memories for Patrick and I. I feel I need to take his bikes down and ride them for him. Also want to see his Texas friends and remember Patrick with them. You know as I think about life going forward I can't help but wonder if some may question why I may continue in motorcycling since that is how we lost Patrick. I can understand that, there's a part of me that feels like I should walk away from it. I mean I would give anything to have that day not happen. I would gladly forsake all motorcycling to have him back. The good times and memories with riding are not worth the loss. But really the motorcycle isn't the culprit, it's just an inanimate object. It's the circumstances that lead up to this I struggle with. Is that God's fault? It isn't fair that Patrick didn't get to chase him dreams and life his life on earth to the fullest but I didn't tell him of Jesus and God's love for him so he would have those things (though I obviously expected it). Rather I spoke of this so he would have a hope and understanding of what lies beyond this world. So no, I don't blame God but I'll be honest, the human/father side of me does at times struggle with the "why" of it all. Why didn't God intervene to heal or better yet avoid this? Why did he let me be Patrick's dad? Would he have been better off with someone else or staying with his birth mother as she struggled through being a single parent? I don't know, but these are thoughts and questions I will struggle with as long as I walk this earth. . What I do know is Patrick was a tremendous blessing to those who's lives he crossed. Of course he wasn't perfect . . . . but he was wonderful! I had the opportunity to love him and point him to Jesus. Patrick added so much joy, happiness and fun to my life; I must not forget I did nothing to deserve that. In Patrick's own words he said "I'm from for God so loved the world he gave his only son and the knowing there is more to life". That gives me a hope this world can't. I can't comprehend what it will be like; I can only imagine but I look forward so much to seeing the relationship with my son restored. A God who loves us more than his Son - I can't comprehend that because I know I would NEVER voluntarily cause hurt to my son for the benefit of others. So as far as still riding & racing, for now it feels right to be involved in something he was so passionate about and that does hold wonderful memories for me. This website in one way, then I also decided to put some graphics on the trailer (thanks to the good people at Summit Custom Sign who knew Patrick and did a great job on this). While he might be embarrassed to see his face plastered on the trailer, I think he'd like the action shots so I hope he finds pleasure is seeing me take his Hobo MotorSports theme and running with it. The trailer will be a rolling memorial & tribute to a wonderful young man and a way to point people to Jesus, so they too will know there is "more to life" and understand this hope. Please don't think that because of this faith I say these words with pious sense happiness or joy, because I don't. I speak these words with a broken heart and with eyes that often well-up with tears - that is the nature of my life now. Despite this I have a hope that even this tragic loss can't take away; this relationship is NOT done but put on a painful hold until I join him. HOBO MOTORSPORTS AT THE OUTDOOR NATIONALS ? 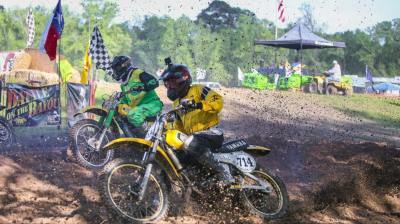 Patrick had hopes of finding an upcoming privateer to partner with after his school. In honor of that dream I thought it would be nice to throw some support behind an upcoming rider. Mitchell Gifford is one of Colorado's top young riders and someone Patrick liked. I had some tentative plans to provide Mitchell with some help to get to the first three outdoor Nationals, however a broken arm at Thunder Valley in March put a damper on that. He was able to ride and tried to qualify for Thunder Valley but just wasn't recovered enough to make the cut. Stilll proud of him to make the effort. We were able to help him and Brett Stralo out a bit with some money for expenses but that was the extent for this year. More vintage races & bikes? Patrick had plans to ride several tracks. In particular Arizona Cycle Park and Glen Helen. I feel compelled to do this for him. Perhaps ACP this winter and Glen Helen next summer? They both have some vintage events I could ride his little YZ in. ran across another 81 YZ125 - which is what his hybrid 100 is based on. and Patrick still have some riding to do.